What practices should you change to improve your business? What habits should you break? Here’s an opportunity to learn how to make the necessary changes to stay on top of your business goals. You’ll get ideas that you can’t wait to implement – just one idea you get from this conference can pay you back in business benefits! Over the course of two intense days (with some entertainment!) we’ll gather together for a series of keynotes, panel discussions and interactive power sessions that will make farm management come to life. Mingle with experts from across the country as they offer advice and answer questions. We’ll give you solid ideas on everything from high-level grain marketing to the key business practices that will help you make more money in 2019. Plus, you’ll be networking with some of the best farmers on the planet. The 2019 Farm Futures Business Summit takes place Jan. 24-25, 2019 at the Coralville Marriott Conference Center and Hotel just outside of Iowa City, Iowa. This event promises to help you think outside the box as you manage the ever-increasing complexity of today’s farm operations. FBS Systems is one of the sponsors and will host a display throughout the conference. The following is a summary of a presentation entitled "Financial and Management Accounting Software--Developments, Implementation Challenges, and Integration Issues" made in July 2018 to the Farm Financial Standards Council Annual Conference in Champaign, Illinois. What are the current technical tools of the trade? How we can support and leverage the Standards? What are the challenges to adoption? What are the opportunities for agricultural producers? FBS's mission statement is Integrated Information Systems (what we do) for Agriculture’s Top Managers (who we work for). Let’s begin with who we “work for.” FBS users are among the most progressive, demanding and complex farming operations in North America. You'll find examples of them nearly every month in the "FBS Users In the News" stories. These operations are managing diverse enterprises, and all are constantly growing in scale and accounting sophistication. Many are nationally-recognized leaders in their fields and some have be selected for awards such as Farm Journal Top Producer of the Year. What’s the big deal about integration? 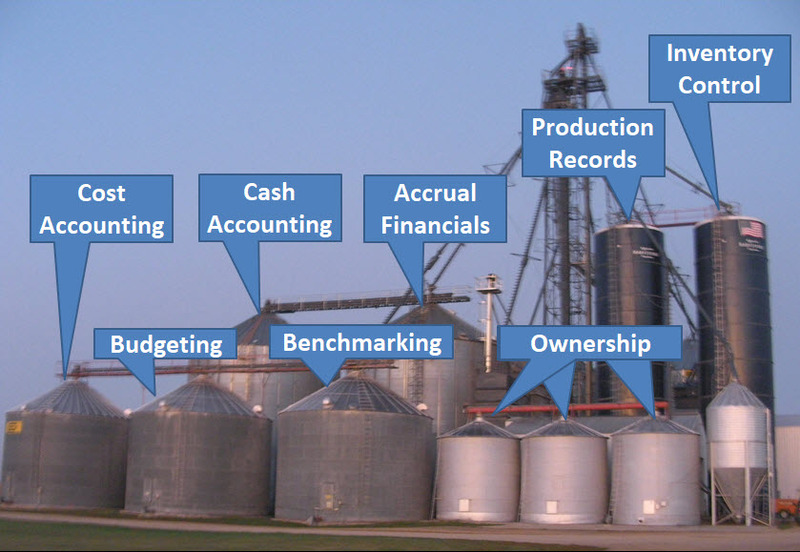 If you’re like many growing, progressive producers your scale and complexity are working against you because this vital information is housed in separate “silos” consisting of unconnected accounting and production software supplemented by countless spreadsheets. 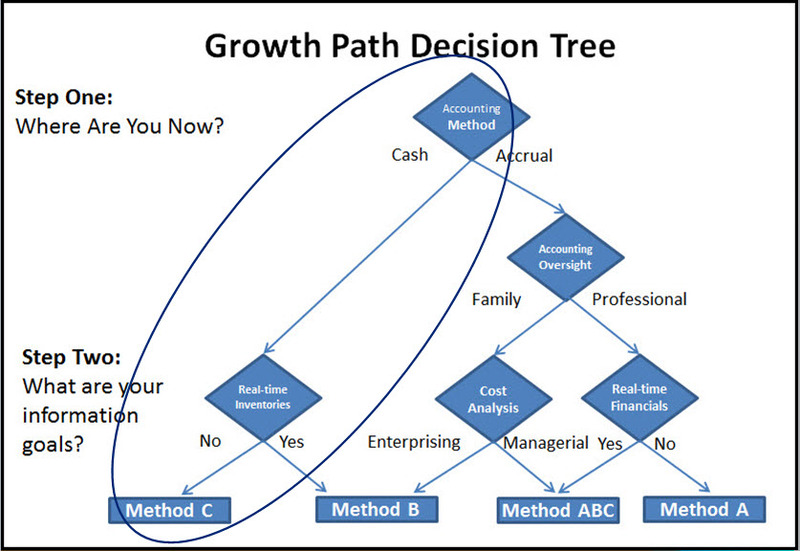 Accrual accounting to accurately measure true profitability. Production records for insurance compliance and to evaluate best management practices. Inventory control to verify what’s available to sell and what’s been used. Cost/management accounting to determine your farm’s internal costs and margins. Budgeting to financially project your operation into the future. Benchmarking to standardize and compare your performance with industry leaders. And ownership accounting to automate and consolidate your complex business relationships. Crop and livestock production cycles rarely correspond to calendar years. Financial accrual adjustments don't tie out to field and group production/management level detail. Next time we’ll look at the current “technical tools of the trade” that address these problems. Meanwhile we invite you to watch our introductory "Farm Software Success Through FBS" video. Do You Report Your Farm Financial Records by Cash or Accrual? Over the past two articles we've contrasted the ways farmers produce financial statements and the conflicting goals of maintaining simultaneous farm financial records by cash and accrual. • Because the IRS allows it, most farmers file cash-basis tax returns. • As a result, the cash-basis 1040 Schedule F intentionally distorts true farm earnings. • Few farmers have the training or incentive to prepare accrual financial statements. Therefore an "adjusted accrual" system (Coordinated Financial Statements) was developed by Tom Frey and Danny Klinefelter at the University of Illinois in the late 70s. Further refined and re-dubbed "Agricultural Financial Reporting and Analysis" (AFRA), this methodology is the heart of the process adopted by the Farm Financial Standards Council. 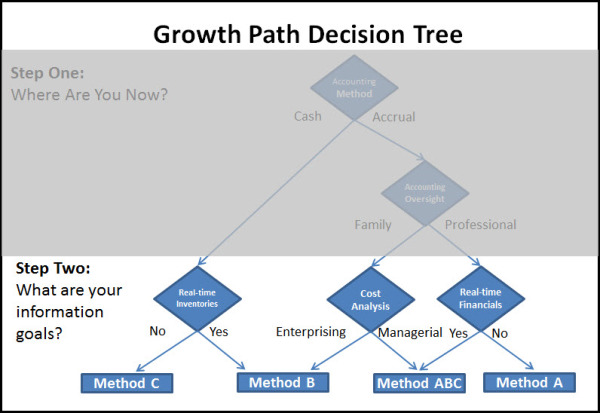 Will Quickbooks Do Farm Accrual Accounting? We ran across this AgTalk post by Mark Wilsdorf, who markets an add-on to Quickbooks for farmers. If anyone has figured out how to make this ubiquitous small business accounting program function as an effective farm financial management tool it would be Mark.